Travel to all the less-visited parts of the country, and see what others do not. 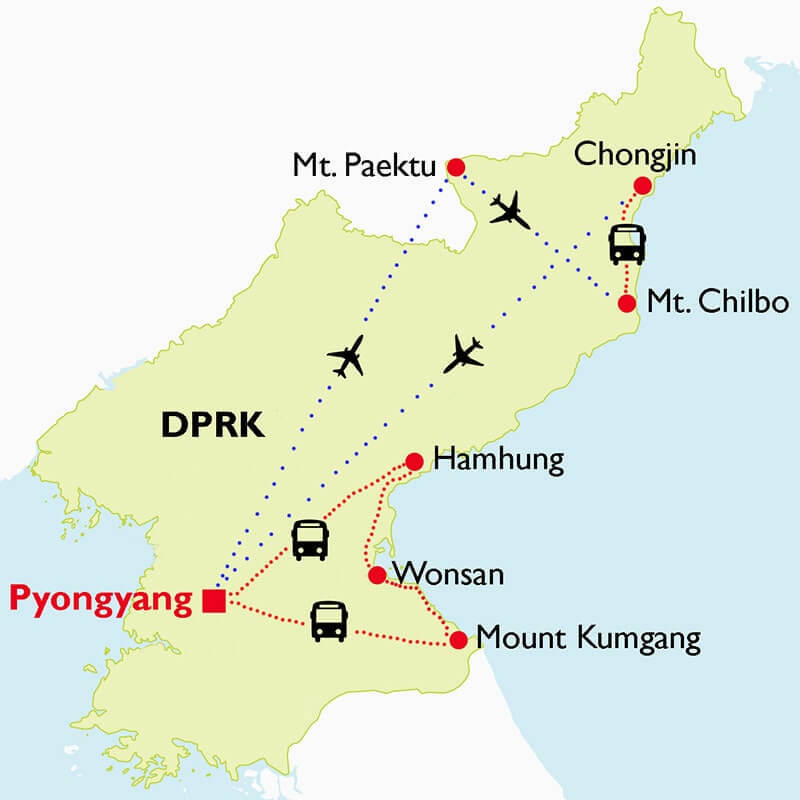 This trips takes in the East Coast of DPRK (Wonsan and Hamhung cities, Mt. Kumgang) sacred Mt. Paektu, industrial Chongjin, scenic and stunning Mt. Chilbo, and remote Hoeryong. As well as some of the quirkier and more esoteric parts of Pyongyang too! Including domestic charter flights on classic aircraft, meeting locals in remote and unfamiliar areas, and so much more! This trip to North Korea is ideal for second-time visitors to the DPRK, or if you’re of the more adventurous kind! 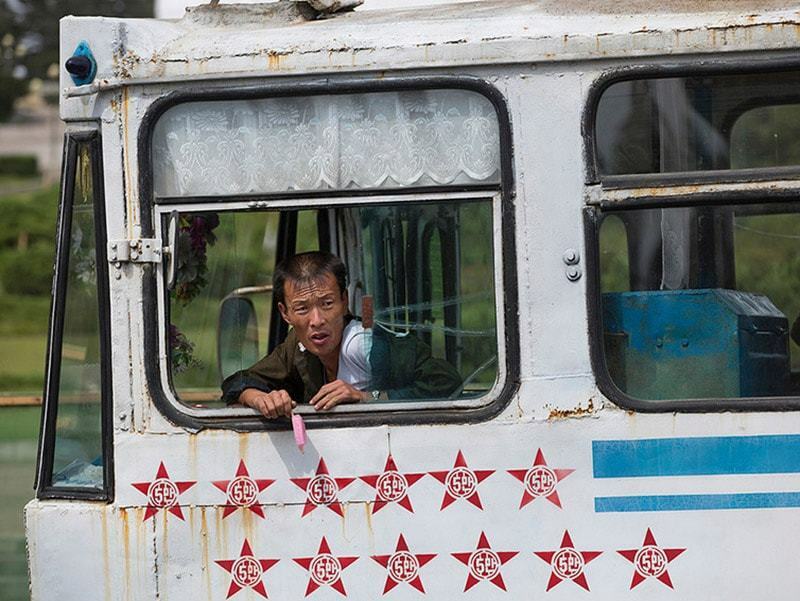 Start your Unseen DPRK Long Tour with us today. Meet our guide at the Beijing Airport then receive the North Korean Visa and flight ticket for your North Korea Tour Packages. Then attend a pre-tour briefing that covers regulations, etiquette, safety, and practicalities while travelling in North Korea. Please be punctual for the briefing. A proper briefing is an essential part of travel to North Korea. After that, we will provide you with assistance with the boarding the plane to Pyongyang. Your North Korea Tour has already begun. Receive the flight ticket for your North Korea Tour Packages, then attend a pre-tour briefing that covers regulations, etiquette, safety, and practicalities while travelling in North Korea. The briefing lasts approximately one hour followed by a question and answer session. Please be punctual for the briefing. A proper briefing is an essential part of travel to North Korea. After that, we will provide you with assistance with the boarding the plane to Pyongyang. Your North Korea Travel has already begun. Arrive into Pyongyang, you will be met by our Asia Senses local tour guides with a warm welcome, then transferred to the city. En route to the hotel, our guides will point out the Arch of Triumph, the world’s largest triumphal arch. Drive east in 6 to 7 hours across the width of the peninsula before heading north to Hamhung, the second largest city of the DPRK and major centre of industry. Enroute we will have some rest stops at Sinpyong Lake and Ulim Waterfall near Wonsan. Hidden amongst the mountains on the road to Wonsan, Ulim or ‘Echo’ Waterfall is a scenic stopover to enjoy lunch, stretch you legs, or go for a dip in the pool beneath. Upon arrival in Hamhung, visit the exterior of the Grand Theatre and Central Square, the largest theatre building in the country. Continue to Home of Ri Song Gye, home of the first king of the Ri Dynasty (1392-1910) who extinguished the Koryo Dynasty, only to be then ousted by his own son. A traditional hall and pavilion and associated naughty stories of the former king’s retirement years – some not appropriate for the youth! 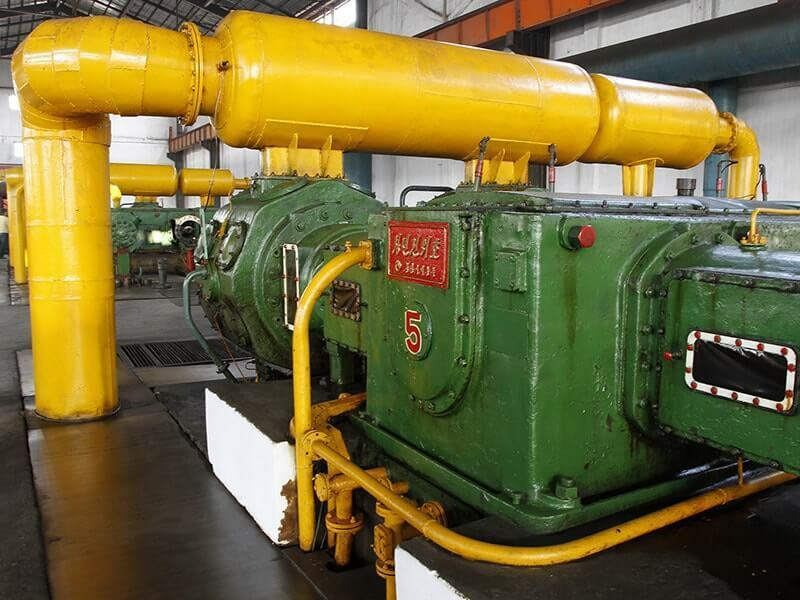 In the morning, we visit the Hungnam Fertilizer Factory, a massive chemical-industrial plant producing various kinds of fertilizers. Tour of the plant control room, production facilities, and packing plant - just don’t light up next to the Ammonium Nitrate! After that, enjoy a scenic drive through the highlands above Hamhung to reach Pujon Highlands, traditionally considered as one of the ‘Eight Great Sights of Korea’. Explore to the Pujon Stone River, a multi-kilometer river of boulders running down the side a mountain and the Okryonsan Revolutionary Site -a base for anti-Japanese guerillas during the colonial period. This region was the sight of some of the most brutal fighting of the Korean War in the middle of the unusually cold winter of 1950. Notice how the local architecture differs from the lowlands beneath. After lunch, return to Hamhung, en route, if the time permits, we stop to visit the Mount Tonghung, home for several attractions: Kumchon Pavilion, Hamhung Wall, Sonhwa Hall, Haebang Pavilion and some other old buildings. Kumchon Pavilion is the northern general's terrace built in 1108, it functioned as a commanding post in wartime and a watch tower in peacetime. It was first built during Koryo dynasty and rebuilt in 1613 in the period of Ri dynasty. Hamhung Wall is at the moment only part of the wall is preserved. It used to be single in mountain area and double in the field and flat areas. The present wall was rebuilt in 1108. Meanwhile, Sonhwa Hall is on the southern slope of Tonghung Mountain is Sonhwa Hall, dating from 1416, but rebuild in 1764. It also has the Chingchong Pavilion. It was the main building of the government office of the province in the period of Ri dynasty. Several building were there but only this Hall and the attached buildings have remained until today. The Hall was first built in 1416 and rebuilt in 1764. After breakfast, start the day with a visit to the Tongbong Co-operative Farm, a local farm in the outskirts of Hamhung. View the machinery barn, a local home, and the farm shop to buy some locally made products. It is a model village with about 1000 farmers. They grow rice, paddy rice, millet, corn, vegetables, poultry and pigs. There are kindergarten, and shop (enjoy local shopping) in the farm. You will also have a chance to visit a farmer's house. 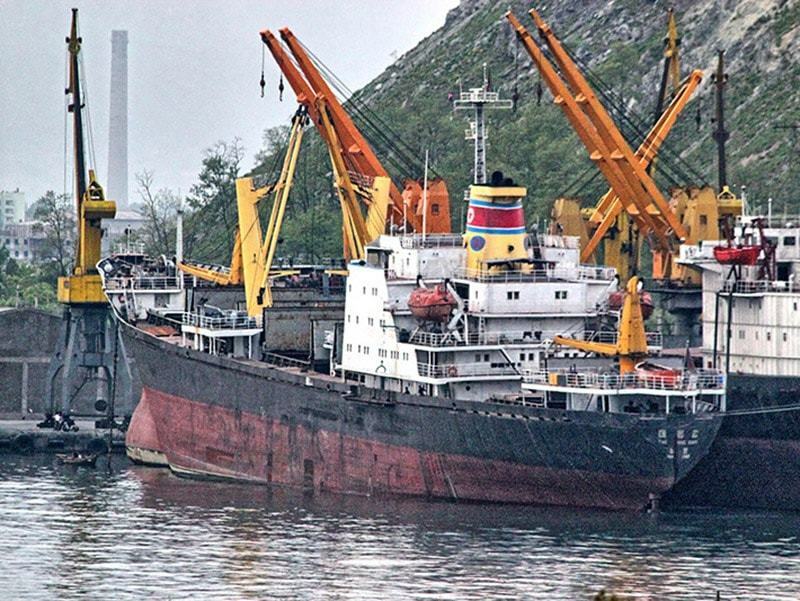 Watch North Korean countryside life go by as we head back to Pyongyang, and on our arrival we will be treated to an evening cruise on the new full service ferry, Mujigae, docked on the Taedong River across from the Juche Tower (optional for $1.50 entrance fee). Overnight at the hotel in Pyongyang. 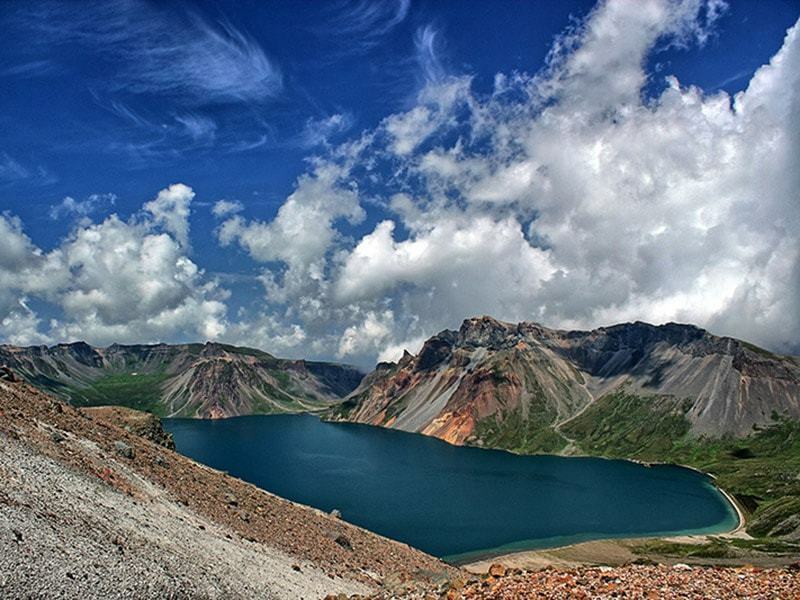 In the morning, we will fly to Samjiyon Town, the gateway to Mount Paektu located in the far north of the country. 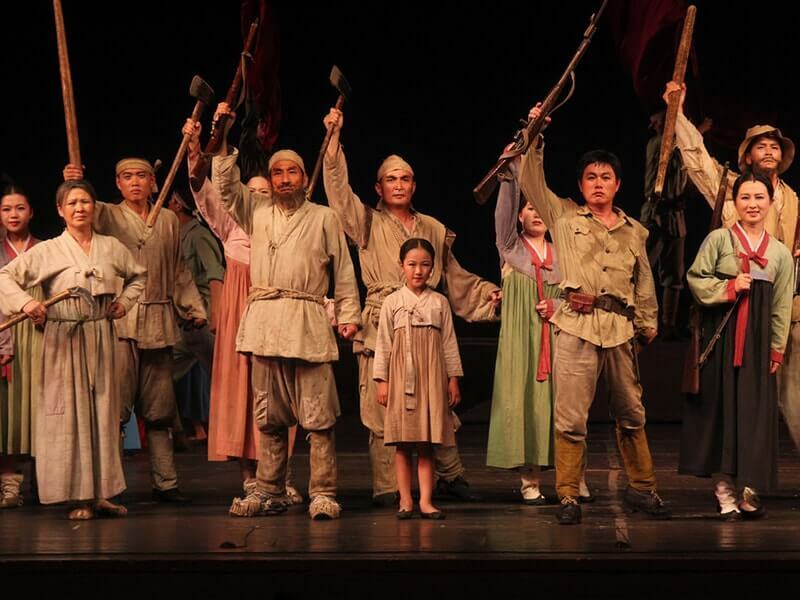 Mount Paektu, ‘Birthplace of the Korean Nation’ and ‘The Sacred Mountain of the Revolution’, is one of the most important locations in traditional Korean history and the modern revolutionary history of the DPRK. Atop the mountain sits volcanic Lake Chon in the massive caldera formed in a giant eruption in the 10th century, one of the largest in recorded history. This eruption left behind a decapitated 2,744 meter peak which remains the tallest in Korea. Rarely visited and absolutely unforgettable. Lake Chon is the highest crater lake in the world. It is possible to hike the last few km of the overlooking summit or ride a funicular railways to the top for spectacular views. From here one can either walk down or cable car (weather permitting) to the lake itself to sample the crystal-clear waters. Afterwards, continue to the Mount Paektu Secret Camp, the guerilla headquarters of General Kim Il Sung during the anti-Japanese struggle set in hidden alpine valley lined by towering peaks and said to be the birthplace of leader Kim Jong Il. See the reconstructed camp telling of how the guerillas lived year in and year out. We also have chance to see the Rimyongsu Waterfall - A scenic waterfall which never freezes due despite chilling alpine winters. The waterfall also provides hydroelectric power to neighboring villages. Overnight in the hotel in Samjiyon. Start the morning with a visit to the Samjiyon Grand Monument. The place consists of a group of bronze statues, including one of President Kim Il Sung, and stone monuments next to a scenic alpine lake. One of three ‘grand monuments’ in the country. We will then take our flight onwards to Orang Airport in North Hamkyong Province, reaching Mount Chilbo. Upon arrival at Mt. Chilbo, we will start our tour of the mountain range. 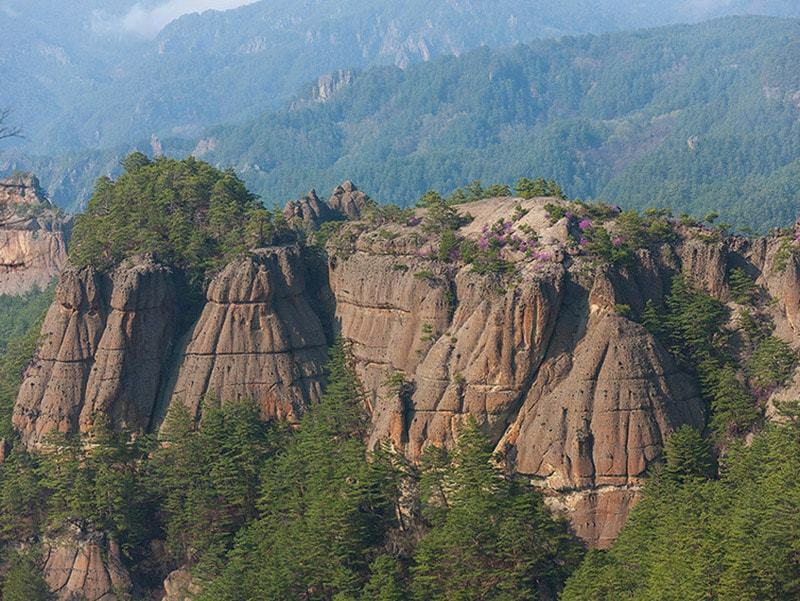 The ‘Seven Treasures’ mountain is one of the DPRK’s most remote and scenic areas with a vast array of strangely shaped peaks and unique geologic formations. This primordial landscape is home to many colourful (and suggestive) legends and offers a contrast to the densely populated cities and agricultural areas seen in much the rest of the country. There is an opportunity for us to join local games and dinner at the local homestay village. This is the only place in the DPRK where foreigners can stay with a local families. Brush up on your Korean (or body-language) as for an evening spent with the family. It is also possible to play volleyball against or wrestle the village team. We’ll leave Mount Chilbo by way of the scenic coastal road (weather permitting) that leads to Kyongsong and Chongjin - The DPRK’s third largest city, provincial seat of North Hamkyong Province, and Korea’s ‘city of steel’ - home to the massive Kim Chaek Iron Works. Continue to the Chongjin Revolutionary Museum, Museum depicting the revolutionary struggles of the region followed by a visit to Chongjin Central Square, Central Square of Chongjin city with statues of the DPRK leadership. A presentation of flowers is customary (2-3 EUR). 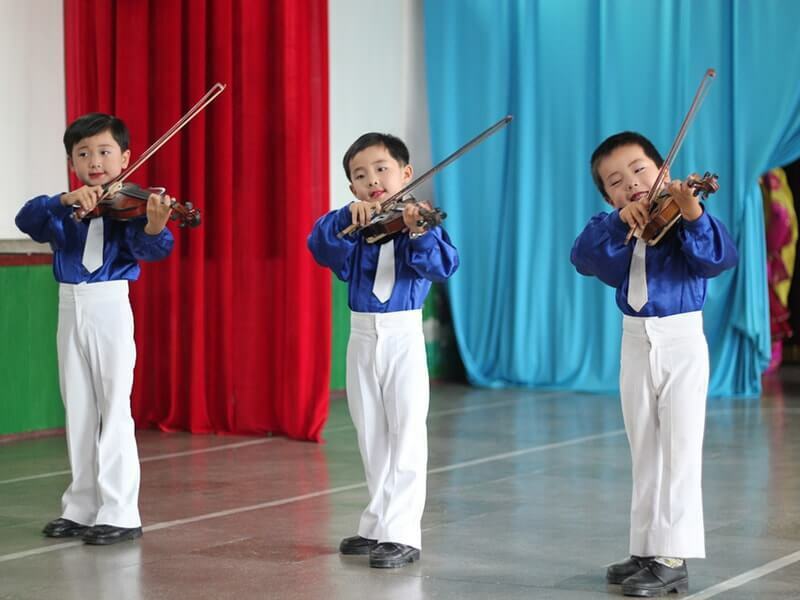 After lunch, we visit the Steelworker’s Kindergarten and Performance where you can see a small student musical and theatrical performance. In the late afternoon, indulge yourself at the Chongjin Fisherman’s Club. The club is a complex of bar, billiards, restaurant, and sauna for merchant mariners visiting the Chongjin Port. A great place to relax after days on the road in the northeast. Overnight at the hotel in Chongjin. Venture northern Chongjin city in a 3-3.5 hour drive before we set our foot in Hoeryong, a rarely visited city on the border with China. Once here, pay a visit to Central Square and Statue of Mother Kim Jong Suk. A presentation of flowers (2-4 EUR) is customary here. Then continue to the Native House of Kim Jong Suk, a traditional Korean home of Kim Jong Suk set among a peaceful apricot orchard. 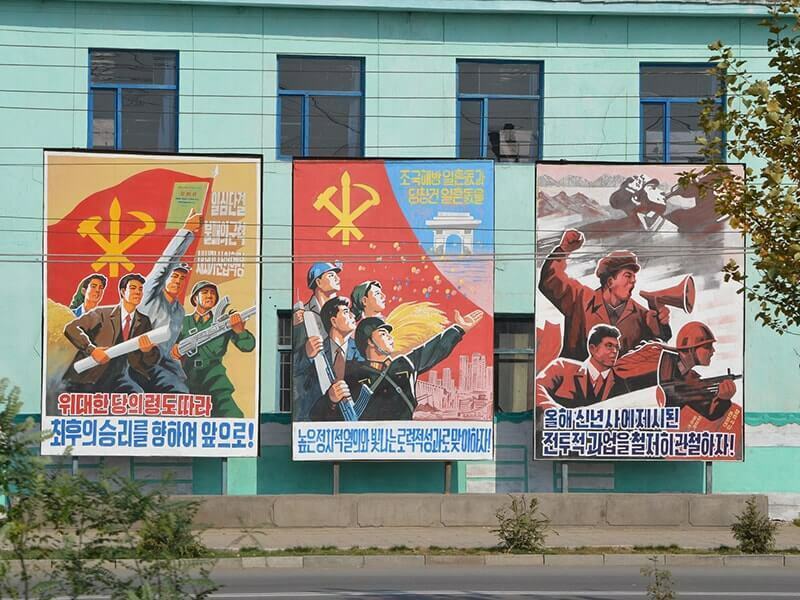 Our next stop is Hoeryong Revolutionary Museum, the museum depicting the revolutionary struggles of the region. Particularly interesting for its giant mural depicting the ‘Three Generals of Mt. Paektu’ during the anti-Japanese revolutionary struggle. The painting was made by artists from the Mansudae Art Studio in Pyongyang and smaller replicas of it can be found throughout the country. The final highlight of the day is Kim Ki Sung Middle School, a local school named after the brother of Kim Jong Suk in Hoeryong City. Tour the facilities and drop in on classrooms to help practice English with the students. Overnight at the hotel in Hoeryong. In the morning, drive back to Chongjin and visit the North Hamgyong Province E- Library, a library, study, and computer centre for the province, located just off Chongjin Central Square. The next stop is Chongjin Trolley Bus. Take a ride down Chongjin’s main drag on one of the city’s trolleybuses. In the afternoon, we will drive to Orang Airport to catch our charter flight back to Pyongyang. Upon returning to the capital, visit Kwangbok Supermarket, a five-story department complex filled with local and imported product and the only place in Pyongyang where foreigners are able to exchange and use the local North Korean Won. For dinner, we will be treated to an evening cruise on the new full service ferry, Mujigae, docked on the Taedong River across from the Juche Tower. Start the day with a visit to the Kumsusan Palace of the Sun, the grand mausoleum where the late leaders lie in state and the most solemn location on the itinerary (closed in May and June). Please note formal dress is required. Men require collared shirt with tie, dark non-jean pants, and dark shoes. Women require covered shoulders, knee-length dress or pants, and closed toed shoes. After lunch, visit the Mangyongdae Native House, the birthplace and childhood home of President Kim Il Sung, a traditional Korean house in a beautiful natural surrounding. Head deep underground to take a 5-stop ride on the Pyongyang Metro, the deepest metro in the world with stunning artwork reflecting the name of each station. Ride six stations on the Chollima Line. 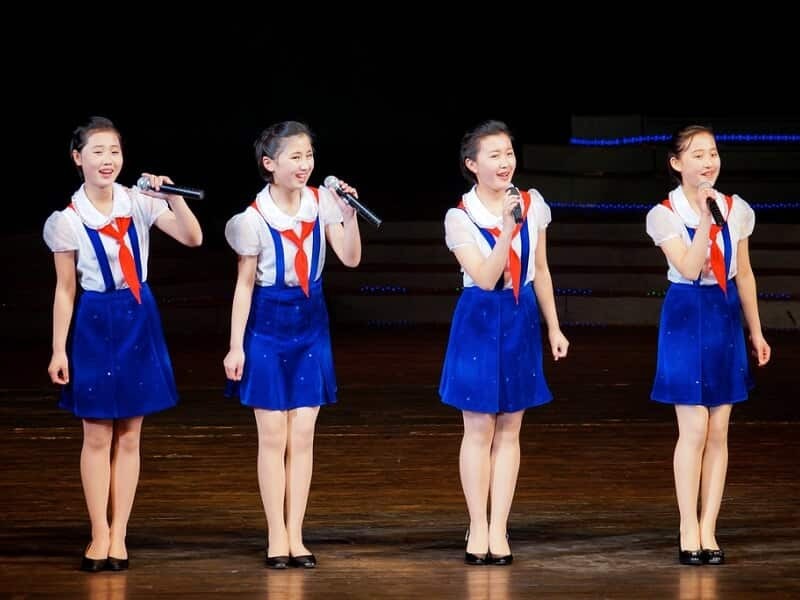 Optional: Take a one hour circus show including clowns, trapeze artists, jugglers, and much more at the incredible Pyongyang Circus (20 EUR entry fee paid at the door).